American Cruise Lines is sailing through New England this summer with the newest small cruise ship on the Eastern Seaboard, American Constitution. 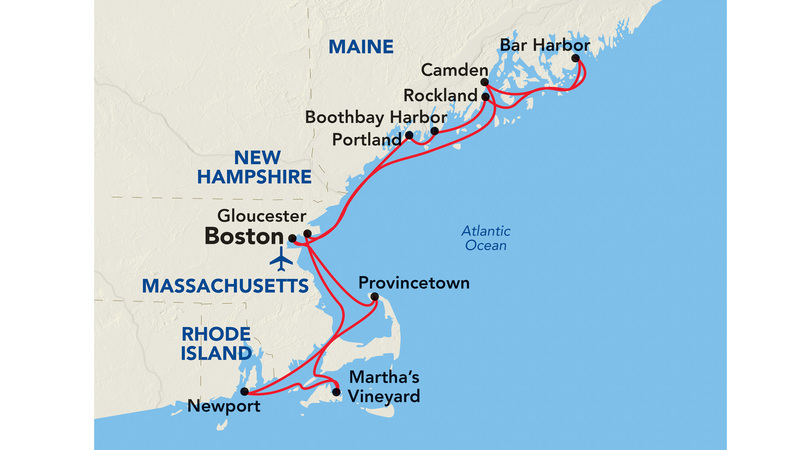 The Line’s renowned 11-day Grand New England itineraries will feature complimentary authentic New England-style Lobsterbakes, visits to captivating seaport destinations, and Yankee fun both on board and on shore all summer long. American Cruise Lines is sailing through New England this summer with the newest small cruise ship on the Eastern Seaboard, American Constitution. The Line’s renowned 11-day Grand New England itineraries will feature complimentary authentic New England-style Lobsterbakes, visits to captivating seaport destinations, and Yankee fun both on board and on shore all summer long. The Line currently still has savings of up to $1,200 per stateroom on select Summer-2018 sailings. From late May to early September, guests aboard American Constitution will experience the majestic seafaring heritage of New England coastal towns and quaint island villages while enjoying summer sunsets and warm salty breezes. This brand new, intimate 175-passenger ship, will dock in the heart of each historic harbor, amidst the most popular New England destinations from Southern New England to Maine. At every port, guests will enjoy guided shore excursions and ample leisure time to explore whaling and maritime museums, visit unique shops, and walk along sandy beaches and scenic bluffs. Each cruise will feature exquisite regional cuisine from fresh Penobscot Bay lobsters to the best chowders in New England. American Cruise Lines’ ships have the largest staterooms in the industry with private balconies and full-size bathrooms. Every ship in the fleet has gorgeous comfortable lounges with panoramic views and warm open-air sundecks. In addition to all the New England-themed fun, each cruise will be further highlighted with onboard historians and experts, nightly entertainment, and complimentary cocktails every evening. American Cruise Lines offers the newest ships, the most exceptional itineraries, and the finest amenities available in American river and coastal cruising. American Cruise Lines is the largest cruise line in the U.S. and the premiere leader in the industry. The Line has become the gold standard for cruising in the U.S. through a focus on ship innovation and a tradition of introducing only brand new ships. In 2018, with 10 ships, the Line operates the largest modern fleet of authentic paddlewheelers, small coastal cruise ships and the only modern riverboat in the country. With over 35 itineraries visiting 25 states, the Line cruises along the rivers, as well as the coastal and inland waterways of New England, Alaska, the Pacific Northwest, the Mississippi River system, and the Southeast. Please visit: AmericanCruiseLines.com or call 1-800-814-6880.